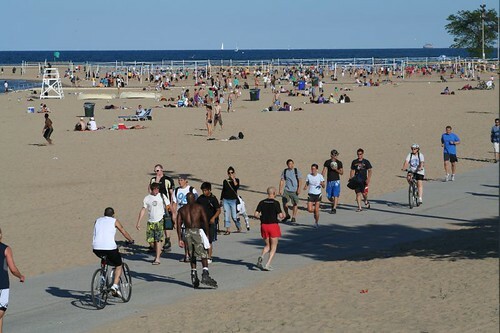 I love the lakefront bike path, and unlike many people, I just find it more exciting when it gets crowded. Remember the gargantuan space battle at the end of Return of the Jedi, with a billion ships flying in every direction, zipping past at breathtaking speed? 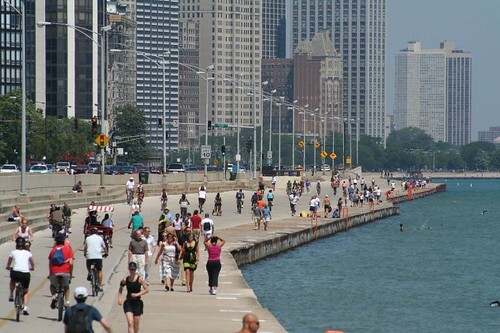 That’s the lakefront trail at its best. Bobbing and weaving, zig-zagging a path through elusive and short-lived gaps, shouting warnings, slowing and accelerating, the kchunk! of shifting gears — I love it. 1) There is a time to lay on the speed, and a time to hit the brakes. When the path is clogged up with pedestrians, slower bikers, roller bladers, etc., etc., that is the time to hit the brakes. This is a multi-use recreational path, not a velodrome. It won’t hurt you to slow down for a moment till the traffic clears (though not slowing down just might.) You will still get your exercise, you won’t lose any race, and nobody would’ve been impressed with your blazing speed anyway, just annoyed at your rude behavior. 2) You are not mute. “ON YOUR LEFT!”, when properly used, is your friend. It’s rude to blast by people who’re only marginally in your way without giving them some kind of warning. Yes, there are lots of clueless people wandering with their head in a cloud. That is no reason to be rude. You haven’t gotten used to this by now? You should. * Yes, I am confident of my biking skills to the point of arrogance. What about it? **Heck, that’s good advice for a lot of Chicago drivers, too. Unsurprisingly, I’m far from the only resident who has something to say about the bike path. The bridge cross after navy pier? Hrmph. Very nice blog!Very informative. I will come back and will link your blog to mine, if you do not mind. My blog is Revel Chicago. http://revelchicago.blogspot.com/ will be glad to have your comments on my blog.